In our latest Toyologist review, The Tot Testers have been having a go at Playdoh's Fun Factory set. So, did it keep them amused or was it a five minute wonder? 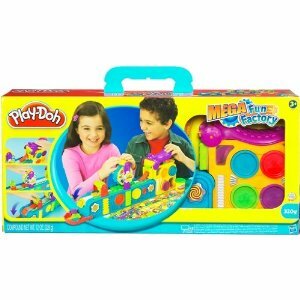 Playdoh is something I remember from my childhood, both from school and at home, so I was as interested to see what the Mega Fun Factory did when out of its box. It's quite heavy- some could say that's a good feature as it lessens mess as children can't up end it. However, apart from needing 2 batteries it requires no other adult assembly, or supervision, although it is a good idea with a toy with this much scope to cause mess to stick near to the kids while they play! The premise of the toy is simple, the factory element is within the conveyor belt, and the child has over 15 molds, contained on wheels which fix on a frame above the slow moving conveyor belt to chose from. They also have 4 different colours of Playdoh included, although obviously it's also compatible with other Playdoh colours bought separately. They simply use the molds and Playdohs to shape different animals and food stuffs. It is very limited, and even Big Tot who is 3 and a half was bored after the first ten minutes of play. Little Tot, meanwhile, was more interested in either trying to eat the Playdoh whether it had been shaped into "food" or just straight from its little container, or he also enjoyed smooshing the efforts made by Big Tot, which also meant she got annoyed. The mess left behind from this toy, after a short while, was quite shocking. Even though they were closely watched whilst they played, I still found little bits of the stuff on the carpet afterwards, and after one piece, though small, got stuck to the bottom of a shoe it was ground into the carpet. The toy itself, especially the mold wheels, are very hard to clean, as unless they are cleaned straight after they have stamped onto the Playdoh, then it dries out and goes hard in the corners very quickly. I don't think the design is that well thought out either- the mold wheel, which makes the shapes is practical in theory, but in practice causes a few annoyances to a child as they are unable to see what shape they may get from the wheel. I think having 15 separate little stamps may have been a better idea, even if they didn't store as well in the main factory body. Considering the price of this toy, it really doesn't have the wow factor, not in our home anyway! It has been played with twice in a few weeks, but for no longer than between ten and twenty minutes each time, before both the Tots have gone off to play with something else instead- in fact Big Tot stopped playing with the Mega Fun Factory in favour of a story book! And at £24.99 it's something which you would expect much more enthusiasm for it to justify the price tag. I think the problem is that Playdoh, although something popular when I was a child in the 80's, is showing it's age- certainly calling a toy "mega" now is dated in itself- and it really is lower down the fun scale when up against newer, more tech based toys. I really wanted the Tots to like this, in fact I wanted to like this myself, but it hasn't exactly been a must play toy in the Family Panel house. Sorry Playdoh!